RENÉ, PATRICE, priest, Recollet, missionary; b. 1667 in France; d. 1742 in Paris. Patrice René joined the Recollets in Paris in 1682 and made his profession the following year. He came to Canada around 1690, and on 30 June 1693 he signed a baptismal certificate at Beaumont, near Quebec. In 1703 he arrived in Port-Royal (Annapolis Royal, N.S. ), joining his confrère, Father Félix Pain, who had been chaplain at the fort since 1701. René became the first superior of the convent which his order founded at Port-Royal, and in 1708 he was appointed the bishop of Quebec’s vicar general in Acadia. In addition to ministering to the parish and visiting the missions near Port-Royal, Patrice René gave his attention to education and opened a school for boys in Port-Royal, probably for whites only; Sister Marie-Élisabeth Chausson, of the Congrégation des Filles de la Croix, had been running a school for girls there since 1701. Several differences arose between the Recollets – René, Pain, Justinien Durand – and certain officers whose conduct seems to have been unsatisfactory. 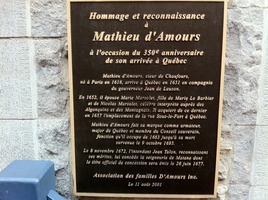 When Marie Mius d’Entremont became pregnant by the officer François Du Pont* Duvivier, the Recollets made the couple get married in January 1705, even though the king’s lieutenant in Acadia, Simon-Pierre Denys* de Bonaventure, forbad the marriage. Patrice René wrote that the Sieur de Bonaventure had scandalous relations with Louise Guyon, Mathieu Damours* de Freneuse’s widow, and that he had had several children by her. Bonaventure continued to keep this lady at Port-Royal despite the king’s orders to send her away. Patrice René went to France in 1707 to request of the minister of Marine, Pontchartrain, that these scandals be made to cease. He reached La Rochelle in August 1707. In October, replying to his request, the minister urged him to return to his mission – he hoped that Mme de Bonaventure, Jeanne Jannière, who had just been sent there, would succeed in improving her husband’s conduct. His later duties and activities in France are not known. He died in 1742 in Paris. Archives acadiennes, Université de Moncton, Fonds de Placide Gaudet, “Missionnaires de l’Acadie.” Archives des Franciscains (Montréal), Dossier Patrice René. AN, Col., B, 22, ff.155v, 174v; 29, ff.238v, 247v; C11D, 4, f.316v; 5, ff.95, 103, 195v, 221, 259; 6, ff.104v–5v. PAC, MG 9, B8, 24 (registres de Saint-Jean-Baptiste du Port-Royal) (original of the volume for 1702–28 is at PANS and that for 1727–55 is at the Diocesan Archives, Yarmouth, N.S.). Arsenault, Hist. et généal. des Acadiens, I, 83–84. Lauvrière, La tragédie d’un peuple (1924), I, 189. Omer Le Gresley, L’enseignement du français en Acadie (1604–1926) (Bathurst, N.B., 1926), 52. Anselme Chiasson, “RENÉ, PATRICE,” in Dictionary of Canadian Biography, vol. 3, University of Toronto/Université Laval, 2003–, accessed April 20, 2019, http://www.biographi.ca/en/bio/rene_patrice_3E.html.